Off-season at Maine's Kennebunk Beach. Located near the town of Kennebunk, the Kennebunk Beach is a broad swath of sand stretching approximately 2,500 feet. It is a popular destination for swimmers and surfers visiting the nearby towns. There are no lifeguards at this beach, but it is an excellent location for beachcombing, building sand castles, or simply relaxing on the sand. Although there is no entrance fee, a permit is required to park at the beach. Contact the Kennebunk Town Hall at 207-985-2102 for more information. North of Kennebunkport Village is Goose Rocks Beach, a favorite of runners and walkers. This wide, smooth, sandy beach is a great place to relax or play in the waves. Although entrance to the beach is free, the Tides Beach Club hotel is located nearby and provides services to hotel guests on the beach which may make the area crowded. Purchase a parking permit at the Kennebunkport Police Station; call 207-967-2454 for more information. 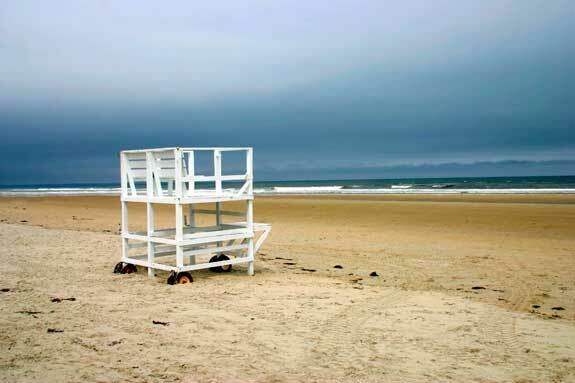 The town of Ogunquit, called “Beautiful Place by the Sea,” lives up to its name with the lovely Ogunquit Beach.Conde Nast magazine recently rated the beach one of the top 10 beaches in the United States. The sandy beach stretches along the coastline for three miles. Enter from Beach Street in Ogunquit’s downtown area, from Ocean Street, or from Bourne Avenue in nearby Wells, Maine. Each beach entrance has public parking and fully-equipped restrooms. If you do not have a car, hop the Ogunquit Trolley to enter the beachfront area. Call 207-646-2939 for more information about the Ogunquit area and beach. If you are looking for a fun, exciting beach destination, the Old Orchard Beach may be for you. The beach extends for seven miles along the coastline, featuring a wide expanse of sand. Sunbathers, beachcombers, and runners love this beach area for its length and size. After an afternoon on the sand, visit the nearby amusement parks, go-kart tracks, or waterparks. Alternatively, rent beach cruiser bikes, canoes, kayaks, or rafts for more fun in the sun. Access to the beach is free; call 207-934-2500 for more information. Located in Saco, Ferry Beach State Park is easily accessible from nearby cities. The 117-acre park features several miles of white sand beaches stretching from Pine Point to the Saco River. This area is popular with swimmers and beachcombers as well as those simply hoping to soak up the sun’s rays. The park offers a changing room, picnic areas, and a group shelter. Note the stand of black gum trees, which are very rare at this relatively high latitude. You may not bring your dog on the beach from April 1st through September 30th, although pets are allowed at other times. Ferry Beach State Park costs $4 for residents and $6 for non-residents; call 207-283-0067 for more information. The Wells Reserve in southern Maine boasts one of the last undeveloped sand beaches in the state. Managed by the Wells Reserve at Laudholm and supported by the non-profit organization Laudholm Trust, the grassy dunes are great for walkers and beachcombers. Naturalist-led walks through the beach and marshes provide valuable information about this endangered natural resource. The beach is open to the public every day; call 207-646-1555 for more information. Located in York Beach, the Long Sand’s Beach provides excellent opportunities for recreation and relaxation. This long, sandy beach provides a designated surfing area for surfing enthusiasts to ride the waves. Rafts and beach umbrellas are available for rent. Park your car in metered parallel parking spots, located along the entire 1.5 mile stretch of beach. If you do not want to drive, a trolley service is available to bring beachgoers to and from town. Lifeguards are present from Memorial Day through Labor Day to keep swimmers safe. Call 207-363-4422 for more information.